It’s the holiday season and that means two things: shiny new devices and lots of apps for getting things done! There will be more people taking valuable actions and more opportunities for you to be there when people are looking. According to Adjust, people who install apps in December complete twice as many in-app actions—like buying a gift or beating the first level of a game—within 24 hours. Universal App campaignshelp you show your apps to these users wherever they are—Google.com, Google Play, YouTube, and over 3 million sites and apps in the Google Display Network. Today, we’re sharing new insights and best practices to help you make the most of your app campaigns this holiday season. It’s important to reach consumers when they’re interested in discovering and engaging with new apps. But many marketers get their timing wrong, even during the most important time of the year. Take Black Friday as an example—Singular found that installs peak during the week of Thanksgiving. However, many app marketers jump the gun—marketing activities peak 10 days before Black Friday, dropping about 30% on the actual holiday weekend. So don’t leave consumers out in the cold when they’re knocking! Get your timing right this season and ensure your campaigns are live during peak periods. To learn more about how to succeed with Google App ads, check out our best practices. People turn to apps for inspiration when they’re in-market for gifts. In the U.S., AppsFlyer found that 12% more people spend money in apps in November and December compared to any other time of the year. For eBay, holiday campaigns are all about finding consumers that want to complete their shopping with ease. And they’ve found videos to be a great way to win the attention of shoppers who are researching and ready to take action: “The scalable video format allows us to seamlessly highlight eBay’s value proposition of massive selection, fast and free shipping and best value,” says Sadie Daryan, Global Head of Display and App Marketing at eBay. 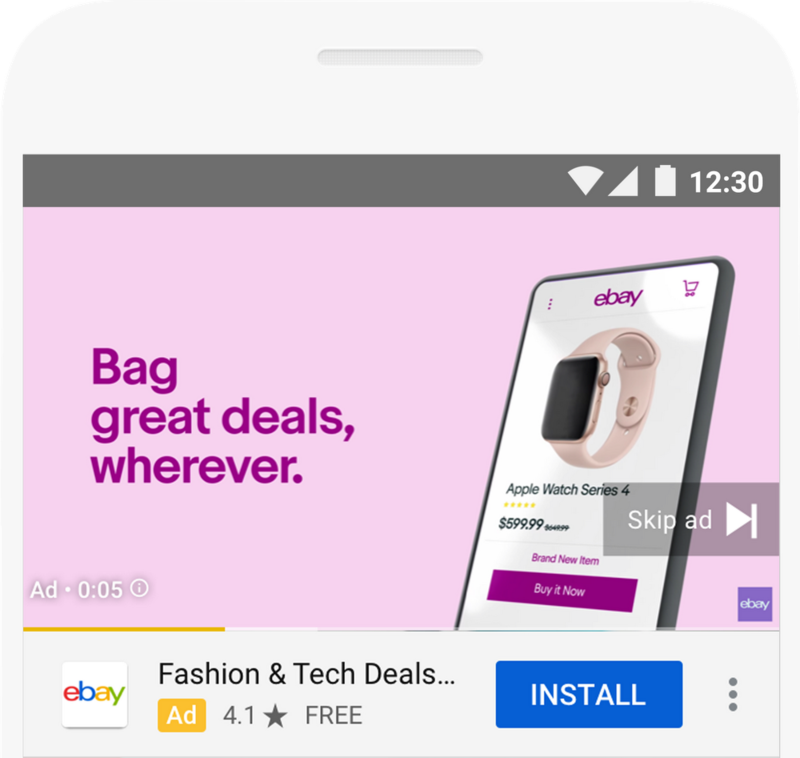 For eBay and other brands, video ads on Universal App campaigns have driven 14B in-app actions over the last 12 months.1 To improve performance, we recommend adding both portrait and landscape videos to help increase your chances of showing the most relevant ad. If you don’t have the resources to create a holiday-specific video, we can help. YouTube’s AutoDirector feature automatically generates personalized portrait and landscape videos for your campaign using existing assets like images, text and ratings from your app store listing. Reach out to your Google Sales team to learn more. Data is your best friend as you prepare for your holiday push, helping you make informed decisions as to when to run campaigns and how to optimize your ad assets. To get a more complete picture of how your holiday ads are working, remember that ads can drive results even if users don’t click on them. That’s why we recently introduced view-through conversion reporting for App campaigns—to help you determine which viewable ad impressions were associated with conversions. After enabling view-through conversion reporting, InnoGames saw a 12% uplift in transactions and adjusted its bid strategy to reach even more players likely to make purchases. Make sure you have view-through conversion reporting enabled in Google Ads and with your App Attribution Partner. And check out our webinar to learn more. We hope these tips help you find valuable new app customers this season. Happy holidays! This entry was posted in Official Google Blog and tagged App Ads, Google Ads on November 8, 2018 by The Official Google Blog.